This led to today finally getting up the courage to use the stove lighter to seal the ends of ribbons, making it easier to create without battling raw edges. I am an adult, and wouldn’t recommend this without age or adults to back you up. I also think a lighter that doesn’t stay on is a bit safer than a candle, which I would only use next to a sink of water. Disclaimers over, this sealing was so much easier to sew ribbon. Without having to add bulk to counteract the fraying and having clean ends was so much better looking. Previously, I had to seal ends with glue, then wait overnight for them to dry. I still need some practice, as the more delicate satin blackened with the flame. I was able to curl and manipulate some organza ribbon to create petals by burning the edges. This happens with sheer fabrics and tulle as well. All in all, I got through the crafting session with no burns and house intact, so a good day for me. 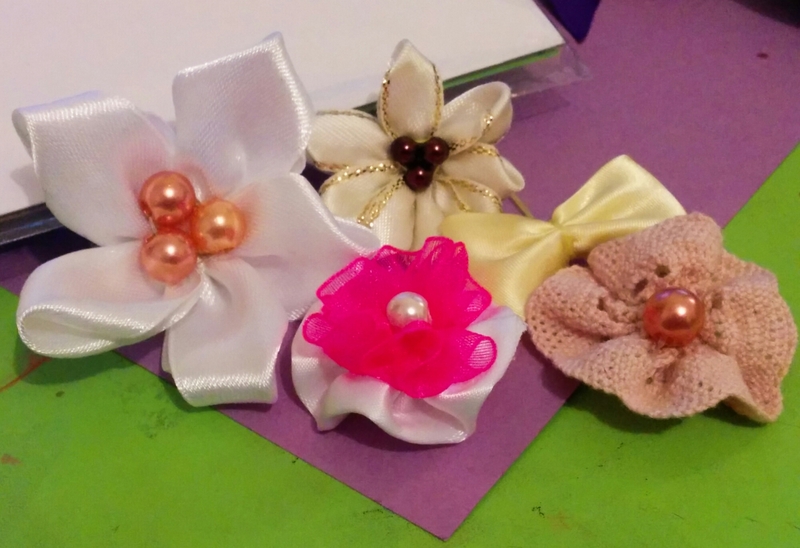 I have a whole folder on my computer of flowers and bows to try, so I’ll likely make some more in the future. Might need a new lighter, though. Photo skills: -50 points for this poor display. I’ve been continuing with my paper flower trend, and although I wasn’t hit strongly with a muse this time, I pushed myself to develop a couple of pieces. Creativity is a great thing, and it’s said the more you use it, the more you will have. This said, I try to push through the uninspired times. I may not end up with the best outcome, but it will not be time wasted, as it often leads into a project or path that is more fruitful. Sitting back, waiting for creative energy does not usually pay off, especially in my case. I didn’t have much to post here in the last few days, as I have been slowly going through the process of filming and editing a video. I finally managed to get up early enough for optimal lighting, and tied my camera to the table with the perfect overhead view. I even managed to record a thing. I just need to find some music, an intro, and put some subtitles so you can understand what I’m drawing, without me talking. I’m not the best at editing, but I can make my way around windows movie maker well enough. I should probably learn how to use Adobe Premiere and After Effects one day, since I have them. So very many things to do. 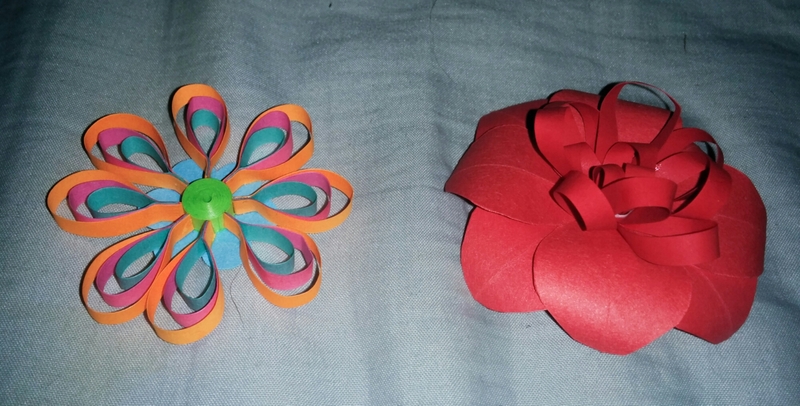 Last night, I spend a good while playing with tissue paper flowers and making tubes of paper from catalogues. 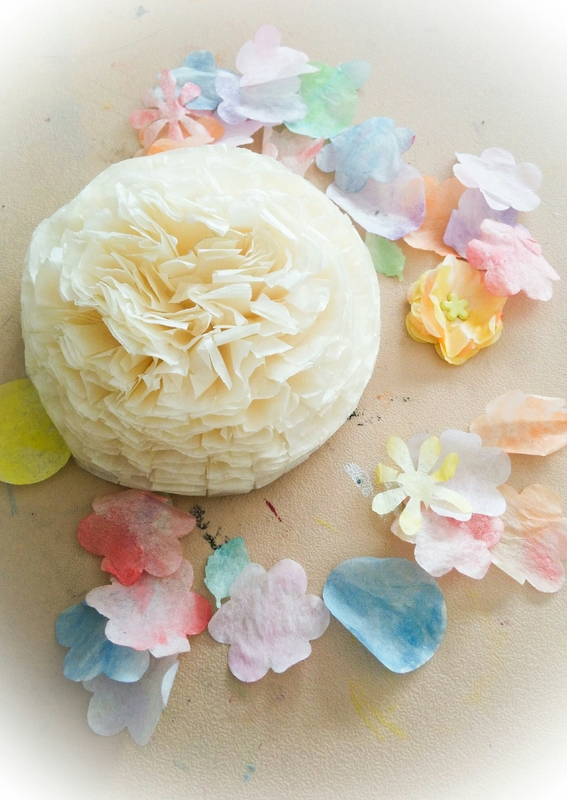 The small flowers were punched out of cream coloured tissue paper, then watercoloured lightly. While they dried, the began to crinkle and curl, which was the desired effect I was after. This gives a nice texture, which gives a more dimensional flower in the end. Ruffling up the petals after putting the flower together also helps, as you can see all the different layers. For these, I used a simple method of stacking four to six tissue paper flowers, then putting a small brad through all layers. You can see one finished in yellow in the picture. When punching out tissue paper, it may be tricky unless you stack the tissue up the thicken the pile. Maybe using card or paper would work, if you don’t need a lot of tissue paper shapes. As for the large flower, I saw the instructions for this a long time ago. Here is a link for the instructions. You basically staple a cross in the middle of a stack of tissue paper circles, and cut short lines about every 5mm around the edge, before fluffing up each circle into a dome shape. There’s another version without the cuts, but it doesn’t look as full. If you’ve been following along, last post, I said I’d gotten some dies with magazines. Here are the results of cutting them all out. All of them work nicely, though the lace edge die needed some extra passes through the big shot machine. I’m looking forward to using them on some upcoming cards. Hey my beauties. I have returned. I never actually left, I just forgot to post. But I’m going to get back into the routine, and update you on the pretties. 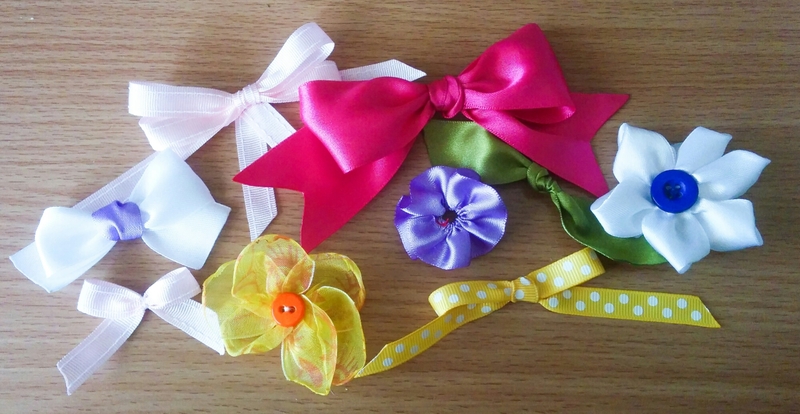 Above you’ll see I’ve tried to make a few flowers and bows with ribbon. Tried being the operative word here. They aren’t too bad at a glance, but they are fairly wonky with petals longer than others, and raw edges. I’m not trusted with fire unless I’m cooking, so it’s tricky to work with ribbon without sealing the edges with a lighter. I’m hoping I can get a bunch of ideas together, so I can sit over a sink and seal a bunch of ribbon edges at the same time. This week’s pay has been long awaited, as I was well enough to go shopping. It took every ounce of my energy, after no going out for a long while, but I did it. I ended up buying three craft magazines, all with free die gifts on them. 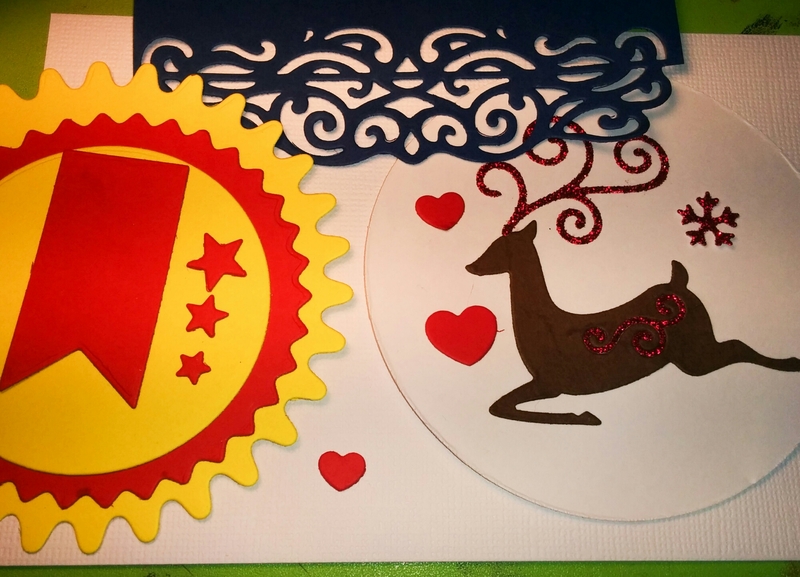 I received a nice laced edge die, a swirly reindeer, with small bow and snowflake, and the final die set included two scalloped circles, a plain circle, a flagged banner shape, three tiny hearts and three tiny stars. The magazines had some good ideas, too, and I’ll likely go through and take notes and sketches at some time. Something I should do with all the magazines I tend to throw in a pile while I use the gifts. I managed to grab some more hot glue sticks before rushing home to bed, so when I recover, I can play around with more ideas using ribbon, paper and plastic cups. Today came with the energy levels of a potato, so between naps and binge watching some shows, all I could manage was a bit of colouring in, and microwaving some food. 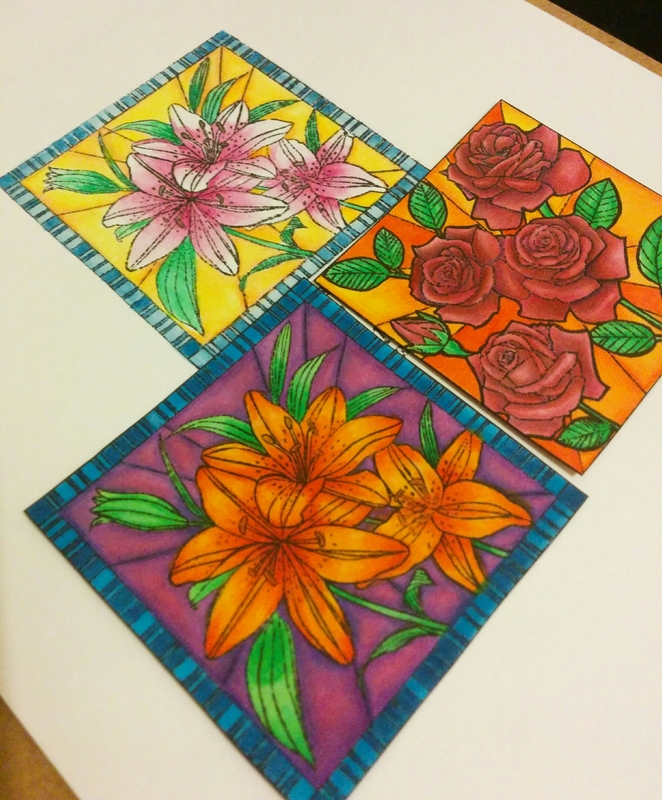 I managed to finish these three squares over the day, and I think they look rather nice. 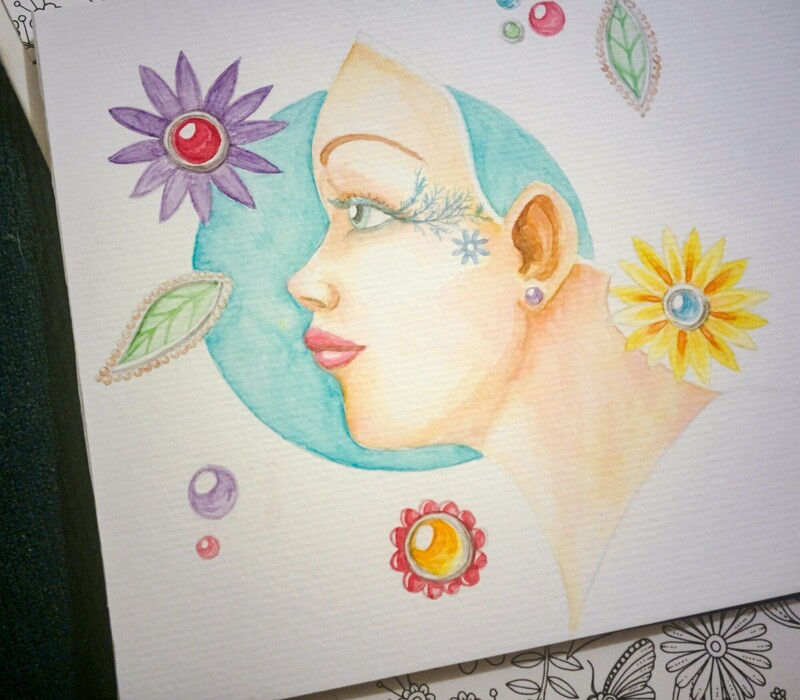 The light one at the top was watercoloured using mainly inktense pencils, and the other two had a simple Copic marker base colour with coloured pencils over the top. I quite like this look, as the white of the page does show through the pencil, and you don’t need a lot of Copic colours to make the shading on the shapes. The colour is also nice and intense. The images didn’t stamp very well, likely due to human error, so I tried to fix it with some fine liners. It worked alright, but only with the thinner liner, which was running out of ink. I don’t mind the effect the thicker pen gave on the roses, as I just outlined the edges. If I had gone over everything, it would have been too much. These panels look nice against black card, so I’ll likely but them onto foam squares, lifting them from a black piece of card as a border, and using them on cards. I’m planning to have a bunch of coloured pieces that I can grab out a box when cards need to be made, like I’ve seen other card makers do. Plus, it makes me feel like I’m doing something productive on a potato day like today, without too much effort. I hope I feel better tomorrow, I have so much to clean this week. For some strange reason, I thought it would be a good idea to spend today stamping all my stamps out so that I could scan them into the computer. While I stand by the fact that this is a good idea, as I can see what stamps I have, colour them digitally, or print them out, this was a tricky task. While I did get into a good rhythm, I had to sift through my piles of crudely sorted stamps to attempt to group together themes. In the end, I only stamped two pages before needing a nap. There was a distinct lack of space where I chose to work, and the wet cushions from spilling my drink limited the space even more. I was stamping them all into marker paper, using Memento Tuxedo black ink, so I could colour and cut out the designs for future cards. 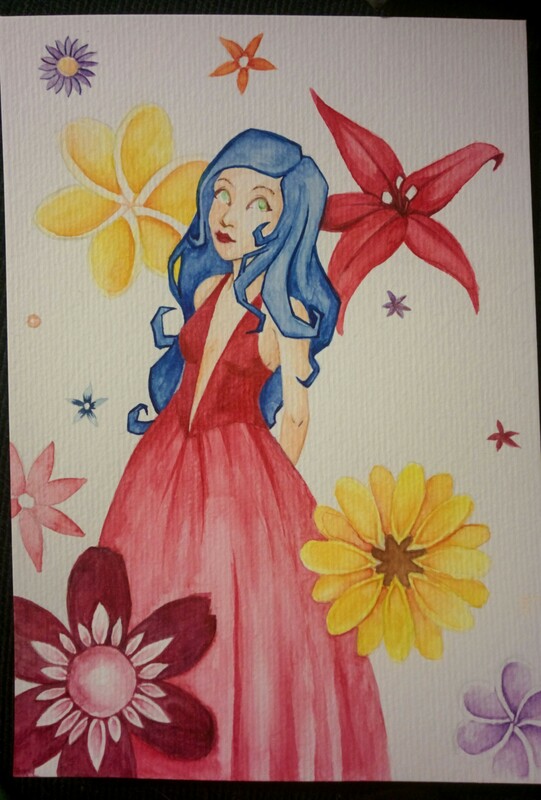 While I had the stamps out, I stamped a couple onto watercolour paper, so I could play with my paints, which I ended up doing this evening. These stamps have so many details that it’s hard to know what is petals or leaves, and which flower each belongs to, so it takes some thinking. 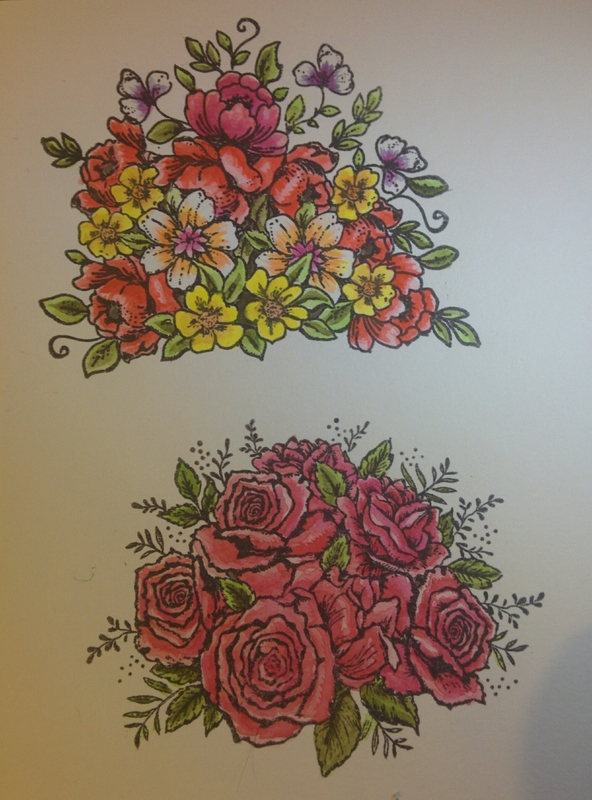 I’ll probably add a bit more shading, especially in the pink roses, as they blend into each other, so adding more depth might help. I’d better get some beauty sleep before tomorrows stream- I definitely need a lot… after I’ve checked all my phone games.